Davis Dalbok, Living Green Design. Chris Bribach, Plants On Walls. Decorator Showcase 2012. Florafelt Vertical Garden Planters. Chris Bribach of Plants On Walls and Davis Dalbok of Living Green team up to create a dramatic living wall for the San Francisco Decorator Showcase 2012. A stunning floating wall of Florafelt Vertical Garden Planters welcomes visitors, first with an array of succulents, both fiery and vibrant, that feather into a serene and shady fern grotto at the entrance. Chris demonstrates how plants are root-wrapped and inserted into felt pockets while Davis explains how the design is arranged to delight with a lush and dazzling visual first impression. Located at the distinguished Hellman Mansion in Pacific Heights, this one-month show features San Francisco’s most prominent and talented designers. 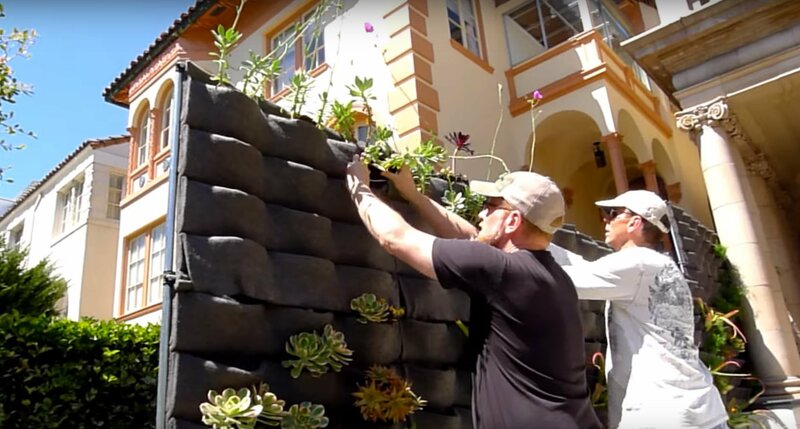 Learn how to create your own vertical garden at www.PlantsOnWalls.com.